With fantastic views of Cascais Bay and the ocean, An exclusive 5 Star Hotel offering some of the best in luxury accommodation, food and a Zensations Spa. Minutes from the Casino, golf and beaches. Discounted rates online. This exclusive 5-star Hotel offers some of the best in luxury accommodation, facilities and food. Situated so that guest will enjoy the attractive views over Cascais Bay. 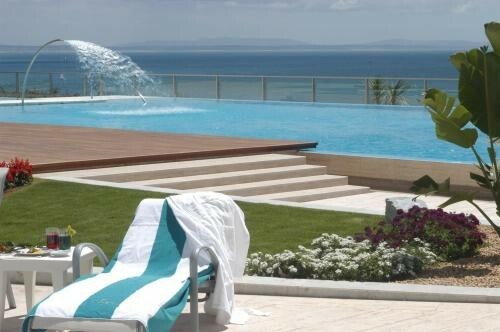 An ideal location as it is only 25 minutes drive to Lisbon and the international Portela Airport. The decoration is an elegant mix of luxury and warmth where nature and space join creating an unique ambience. The bedrooms are spacious and are decorated so that luxury blends with comfort. Guests can enjoy an international floorshow as the Hotel is just minutes from one of Europes biggest Casino. Also, minutes away from the wellknown Estoril 18 hole golf course, and with several others in the vicinity and within easy reach. Hotel Cascais Mirage has a spa and free access to Holmes Place Health Club. The sunset view is especially romantic when enjoyed in the outdoor infinity pool that gives the impression that its water meets the horizon. Most of the rooms and suites have a private terrace overlooking the ocean. It features an exclusive area for meetings and conferences, a beautiful infinity edge pool surrounded by the Restaurant and Bar areas, a Health Club with over 3000 square meters, a Zensations Spa with 7 treatment rooms, 192 rooms and Suites and private parking.